When we were little we would often eat roast chicken with apple sauce and chips. It was one of my favourite meals and still goes down a treat. This is the grown-up version. 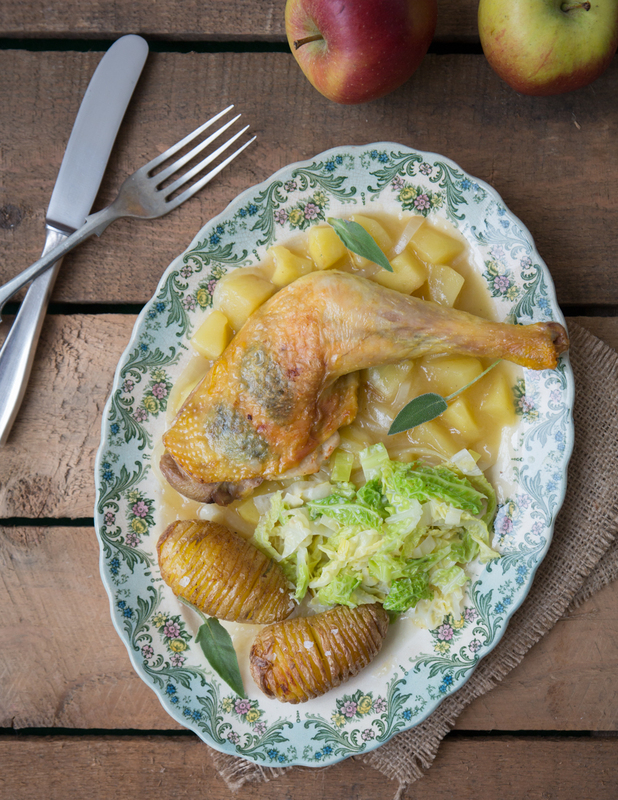 Roast chicken legs on a bed of cider-laced apples and served with Hasselback potatoes – baked potatoes that are thinly sliced to get a crispy outside. For the Hasselback potatoes: Put the potatoes skin on into a saucepan filled with salted water, bring to the boil and cook for 6 minutes. Drain and leave to cool for a few minutes. 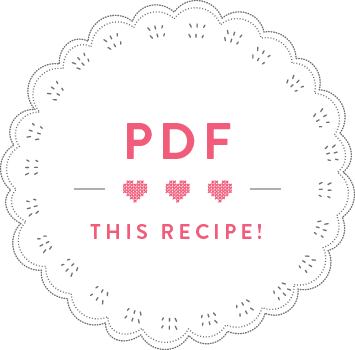 Place a potato into the bowl of a wooden spoon, then cut thin slices into the potato – the knife will hit the wooden spoon about two-thirds into the potato, preventing you from cutting all the way through. Set the sliced potatoes aside. Prepare the chicken. Peel and slice the onion. Heat 1 tbsp olive oil in a frying pan and fry the onion slices for 5 minutes until soft. Put into a roasting tin and set aside. Peel and core the apples and cut into bite-sized chunks. Put into the frying pan along with the cinnamon stick, 1⁄2 tsp salt, the cider and chicken stock. Bring to the boil, then add to the onions in the roasting tin. Peel and slice the garlic clove. Slide your finger under the skin of a chicken leg to make a little pocket. Stuff each pocket with 2 sage leaves and a few slices of garlic into each pocket. Repeat with the second chicken leg. Season the chicken all over with salt. Heat 1 tbsp olive oil in the frying pan and brown the chicken legs on all sides. Place the browned legs on top of the apples in the roasting tin. Keep the fat in the frying pan for the Hasselback potatoes. Cover the roasting tin with foil and set aside – you will bake the chicken and the potatoes at the same time. Hasselback potatoes: Heat 2 tbsp of olive oil in the frying pan with the leftover chicken fat. Fry the potatoes for 10 minutes, turning them from time to time so they start to crisp up on the outside. Pour 25g of melted butter into a roasting tin, add the potatoes and toss them in the butter until evenly coated. Lightly bash the garlic cloves and add them to the roasting tin with the rosemary and a generous sprinkle of salt. Put the two roasting tins into the preheated oven and bake for 45 minutes. Remove the foil from the chicken after 30 minutes so that the chicken skin can crisp up, and turn the potatoes so they roast evenly. After 45 minutes, check that the chicken is cooked through (the juices need to run clear) – if not, roast a little longer. Once cooked, take the chicken out of the oven, but leave the potatoes in until ready to serve. Put the chicken legs on a plate and cover with foil while you finish the sauce. Pour the apples and the liquid left in the roasting tin into a frying pan. Bring to the boil. Dilute the corn flour in 2 tbsp of cold water and add to the boiling sauce. Stir until you get a thick sauce. Serve the chicken with Hasselback potatoes and apple sauce.